UPDATE: The Metro Board at its September meeting approved more study of these two routes. 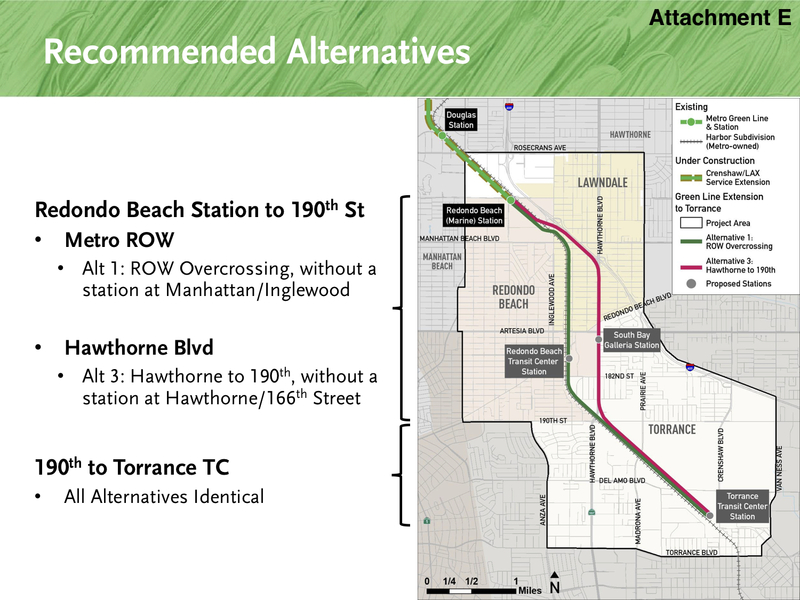 The Green Line Extension to Torrance project returns to the Metro Board of Directors this month with the release of a Supplemental Alternatives Analysis and an agency staff recommendation to further study two of the four routes under consideration. Here’s the staff report and here is the project’s home page. The project includes a 4.6-mile extension from Redondo Beach (Marine Station) south to the Torrance Transit Center (TC), currently under construction by the city of Torrance. •Alternative 1, along the existing rail right-of-way. This alternative would continue the existing aerial section south from the Redondo Beach Station over Manhattan Beach Boulevard before coming to grade at 166th Street with stations at Redondo Beach and Torrance Transit Centers. The estimated cost of this alternative is $893 million. •Alternative 3, which would leave the Metro right-of-way to parallel the 405 freeway. The alignment would then travel at-grade along Hawthorne Boulevard, before returning to the rail right-of-way near 190th Street. As the staff report notes, this alternative — which was developed based on stakeholder input — serves the commercial areas along Hawthorne Boulevard and provides opportunities for potential transit-oriented communities if local cities choose to update their zoning. This alternative has a cost estimate of $1.003 billion to $1.22 billion, which is more than the funding available. Metro staff are asking the Board to approve taking the above alignments forward into a more comprehensive environmental study. Under the Measure M spending plan, the project has a groundbreaking date of 2026 with a completion date range from 2030-33. The Measure M spending plan allocates $891 million for the project, which includes $272 million of local and state funding, some of which is coming from the Senate Bill 1 gas tax and vehicle fee package. The project is also part of the Metro Board-approved Twenty-Eight by ’28 Plan to complete 28 major projects in time for the 2028 Summer Olympics and Paralympics. In order for that to happen, additional funding will have to be secured. Related: Metro staff are also talking to stakeholders this month about a potential operating plan for the Crenshaw/LAX and Green Lines. The issue: As part of the Crenshaw/LAX Line project, the tracks for the new rail line were joined with the Green Line tracks just west of the Green Line’s Aviation Station. That gives Metro the opportunity to move trains between the two lines, meaning there are several options for running rail service in the future. Finally, one more note: Metro staff have also issued a report to the Board on transit line renaming — something that must be done because of the Crenshaw/LAX Line and Green Line junction, as well as the Regional Connector project that is trying together the Blue, Expo and Gold Lines. Here’s a Source post with maps. Would it be too hard to name the pdf files in English. Something that people could read and half way guess what the file was about? Any chance the Green Line would eventually extend all the way down to link to the Blue Line in Long Beach? I like the part where the Green Line *stays grade separated* for the entire route. This line should go south past 190th. There are so many employment centers at Torrance, Carson, Sepulveda and Lomita Blvds. in the city of Torrance. Stop at Del Amo Mall? Cause it’s no where near the right of way. Alternative 3 is totally stupid and more costly. Having a surface level train running on Hawthorne Blvd would make no sense and the traffic is already bad enough. As much as I like Alternative 3, it is way too expensive ($1.2 billion), considering it only adds 4500 riders and two stops. Build this one cheaply. *Especially* if it’s going to just wind up as a stub line anyway. Just for perspective, imagine how else that $1.2 billion could be spent. They could probably fix the Washington/Flower junction, benefitting tens of thousands of existing riders. They could probably even convert the Orange Line to light rail for that kind of money. Can someone please explain the “Cost Per New Rider” statistic on slide 7? It says that “Cost Per New Rider” for Alt 3 is $717. But considering $1.2 billion cost and 4500 new riders, it seems to work out to over $260,000 per new rider. That’s not even close. If you’re thinking for future then the Alt 3 (Hawthorne to 190th) is the one. Want to step back and link to the past, then Alt 1 (ROW overcrossing) with current industry rail line. I go for Alt 3….If you have traveled overseas seeing what’s the economic booming and communities get prosperity by new light rail accessed. Future more people commute on mass transportation. A shame that the extension only goes as far as to Torrance, instead of at least ending the line either at Vermont or with the silver line. That at least could have given LA Harbor College students another alternate way to get around the area without dealing with the traffic hassle. Sorry to be a hater but I really think that we need to stop any new spending until we fix the disasters we have already caused. I understand the need to expand the system in areas with low ridership because of politics and because everyone in the county is paying the additional sales tax but this extension should be shelved. The Flower/Washington intersection should be the first priority for the entire system. The MTA should literally stop what they’re doing and start a preliminary EIR tomorrow morning. This is a PR nightmare and a civic embarrassment. If we are going to extend the green line I would think the obvious extension would be the two and a half miles from the eastern terminus to the Norwalk Metrolink station with an intermediate stop or two at the county offices. Am I missing something? Does this make too much sense? Hear hear, couldn’t agree more! Alternative 3 will have too much speed restricted trackage along Hawthorne Blvd. With two transit centers on the line, it would make more sense to use Alternative 1 which is mainly ROW and gated grade crossings. I think Alternative 1 will give better travel times and it’s less costly to build. Green Line needs to add a stop in Carson and end in San Pedro. Maybe add an West East line from Redondo to Carson to Long Beach and end at Cerritos. Do not run at-grade on Hawthorne! C’mon! We need RAPID transit. That would not be it. Metro keeps on repeating the same mistakes with all the street-running. Slower service + more accidents. That is always guaranteed with such a setup. Keep it elevated. If metro won’t do this then alt 1 it is. Alternative 1 makes the most sense. I don’t like the Redondo Beach Transit Center station location. However, I’m sure many riders will ride right past that station to get to Torrance (or alternatively, northbound from Torrance to LAX). Alternative 3 has the better station location. But, it would be slower for Torrance riders. Either way, please get this built.